How do I know if my baby has baby acne? Baby acne typically looks like small red bumps on the baby's cheeks, chin, forehead, and sometimes back and chest. 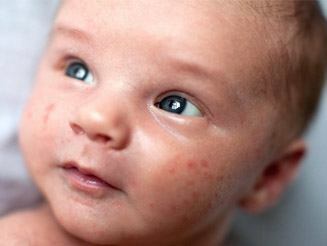 Baby acne is rarely present at birth, and typically develops in babies around 2-4 weeks of age. Baby acne appears to be more common in boys than girls. It is thought that baby acne is caused by hormones passed from the mom through the placenta to the baby during pregnancy. However, researchers are currently investigating other possible causes, but it is not exactly clear at this point what causes baby acne. How can I treat baby acne? You should not treat your baby's acne with any medications or by rubbing the pimples. Baby acne typically resolves on its own within several weeks, although it may come and go for 6 months. It is truly nothing to worry about, and research suggests that baby acne is not related to adult acne. It usually will get worse when your baby cries, is hot, or has been in contact with an irritant (like spit up). You should gently wash your baby's face with warm water or mild baby soap (like this soap, and pat it dry with a soft dry cloth. Some doctors suggest not putting creams or oils on your baby's face, as this might cause the condition to worsen. In the most severe cases of baby acne, some doctors will refer you to a dermatologist who might recommend treatment with medicines such as benzoyl peroxide. Do not treat your baby with any over-the-counter or prescription medicines without first talking to your doctor.